To reach North Wales from here, you have to drive through Betws y Coed, a village which has reached critical mass by being full of people who are here because there is nothing to do. The car park is queuing room only, the main street is lined with cars and fraught drivers trying to edge into half-big enough parking spaces and minibuses from Liverpool and the Midlands dumping their wide eyed passengers in the street and coaches from Manchester unloading crumpled people who are wandering off wondering exactly what there is to do here, and the answer is nothing. So, because this is a little Welsh village and nothing happens here, everyone sets off and walks up and down the road, in the road, with their pushchairs and hyperactive relatives and cross children, and the police drive up and down on Nortons or in patrol cars, ignoring the minibuses which are obscuring the passage of through traffic and alarming the slow drivers who think they may be breaking the speed limit, so they go even slower, and still nothing has happened. By now people have realised that there is nothing to do, so they go shopping. The front room floors of Manchester must be awash with flocks of hearth-mats made from dead sheep, the bedrooms of Birmingham must be vibrant with tapestry bedspreads and cushion covers and antimacassars, the high street of Halesowen must indeed be steep and hazardous, for people are boarding coaches with nicely gift-wrapped crampons and walking sticks from the Rocks’R’Us Rejects Outlet Store. Some women have bought Welsh pointy hats. Some have commemorated the day out by buying melamine tablemats on which the daffodil-laden water flows forever frozen under the Waterloo Bridge and under your dinner plates. Should you be hungry, you can dodge into the Diner (“bikers hikers ‘n’ coaches welcome”) or Mary Jones’ Tea Shoppe (poor little Mary Jones and her quest for a Bible, she never would’ve realised her potential as a marketing tool a hundred and fifty years later) or even The Kings Hotel (whose king? ), where there is Lamb Dinner for £6 minus five p.
And after that there is nothing to do, so you can go across to Swallow Falls and queue to look for a moment at water crashing over the edge of a rock cut millions of years ago by primeval forces of ice-melt, long before the days of table mats. But I have no time for Betws and its grey-net-curtained, grim boarding houses (‘NO Vacancies – why did you dare ask?’) and austere, withdrawn, repressing houses where in the old days nothing truly did happen on Sundays, because I am going to Llan-anonymised. Compared to Betws, Llan-anonymised is stately. It has a by-pass. The shops are closed. This is because the whole visitor population has gone up the road to Ye Olde Railwaye Outlet Village to buy flat sheep for their lounges and tweed nightdresses for their bed-times. If you are a real person you have not got as far as Llan-anonymised; you have parked your Llandrover at Capel Curig, or at the base of the Miners Track up Snowdon, and you are by now marching up the mountains so you can canoe down. The train is for tourists. I think I may have been up on the train once as a little girl, with my grandad. But he could never have walked up Snowdon, because he got his leg blown up for king and country in the days before table mats. It is, indeed, a mad question, because the man behind the counter says that all the buildings erected for the Great War were wooden, and they will all have rotted by now because the war was in 1910, which is a very long time ago. And he knows there is not such a wooden building in Llan-anonymised. He doesn’t even know who would know, because there isn’t anyone in Llan-anonymised who fought in the war, because is was such a very long time ago. And he has never seen any pictures of Llan-anonymised in the very old days, but he knows someone who might’ve done (and he scribbles down the address of the sage). But I mustn’t go and bang on his door. Oh well. He is probably employed for his knowledge of competitive skinned-sheep draught-stopper purchases and because he is willing to subvert his identity and wear a Uniform and a Regulation Tourist Board Fleece with a dragon and greeting-words Croeso. Welcome…….? ………Leave yer money and bugger off……. …..to the next town in the Quest. This is truly depressing, even if I close my mind to the crenellated symbol of oppression. Weirdly, the town’s solid fortified walls have a church window set in them. Surely this would be a weakness – the barbarian hoards would just lob a few rocks at the delicate stone tracery and then scramble in through the hole. Anyway, it’s time for food. There are a few pubs and they are all offering Lamb Dinners at six pounds minus five or fifty p. Some with Mint Sauce. Some with N.Pots. Some with Peas. Some with Welsh Lamb, or Spring Lamb, or Local Lamb. They are all populated by sluggish people who are smoking and getting ratarsed ready to cheer for Everton or Liverpool on Sky after their Lamb Dinner. The streets are slow with tourists. There must’ve been a disembarkation of coaches of elderly women who are too hot in nylon, or too cold in nylon, but grumbling about the temperature (which according to the inlet manifold on my car is 24°C). And virility is on display with the bursting Engerland shirts sopping wet with sweaty male bodies which haven’t seen any exercise in forty years except staggering up on to the tattoo-ist’s couch. Cosmetically bald, fat-legged, blue-armed, dead-eyed grease-guzzlers outside the pubs. That’s why the food is such crap, and cheap crap. It’s a destination for people from oppressing environments who need a day out, want to see the sea, feel the fresh air, enjoy a mountain view and haven’t got much money. Nothing at all wrong with that. But what’s wrong is that they’re being offered badly cooked, unappetising, unhealthy, fatty, cheap food as if it’s been civically decided to provide nothing but crap for people on low budgets, people who don’t deserve a choice. There’s nowhere else to eat. From all the pubs offering crap, I pick one that offers New Lamb Dinner with N Pots, R Pots, Gravy and Mint Sauce, preceded by Fruit Juice. Some people are eating it. It looks foul, slimy, the gravy is E-number-brown and is adorned with floating floppy olive-green beans. I haven’t eaten a Lamb for many years, so I choose baked potato (which accurately should say Nuked Potato) and ask whether, if I have a cheese one, can I have chutney with it. Thank goodness it’s cheap. Then to the museum, where the helpful man in the kiosk agrees to allow free admission so that I can just go to seek answers for the Project. To get to the museum, and specifically to find a human, is a ten minute trek up several turrets, into closed turret rooms, along low passages with just arrow holes and down more winding staircases and I’m in a bit of a panic when I get to a desk where there is a human. Yes, there were drill halls all over north Wales, but no, they don’t know where they are. He does, however, suggest contacting someone, who might be able to help. (This is as unbelievable, again, as ever. An organisation which is so rule-bound has no knowledge of its drill halls…) Have I seen the one at Ruthin? Yes. At somewhere else? Yes. 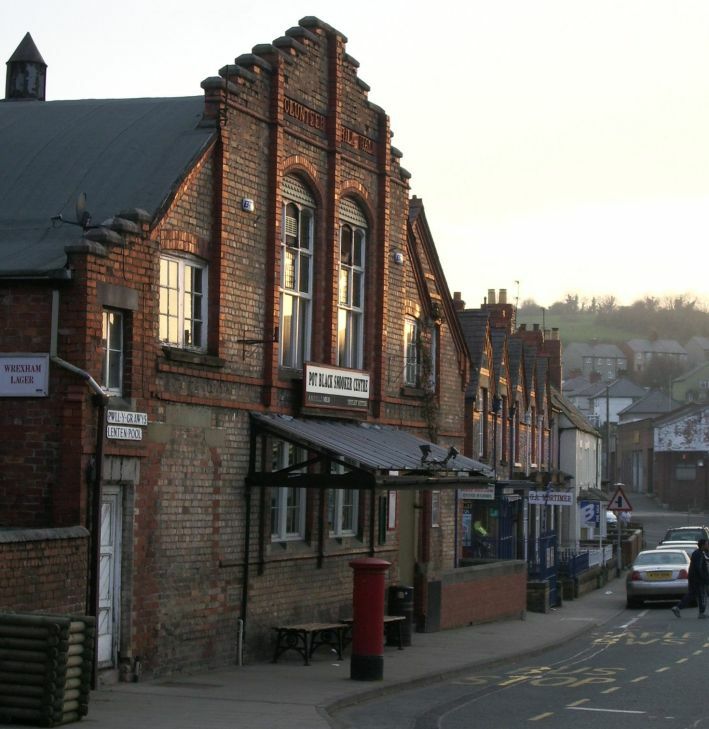 There is still a drill hall in Denbigh, but, he opines, it will be Second World War because it is made of brick and they didn’t use brick in the time of the Great War. But – he announces portentously – it is in use. And here, he has the shocked, appalled air of an evangelical who is about to reveal that it’s now a whore-house, and he lowers his voice: it is in use for (he pales further) …. sports. He looks for my reaction. I suggest that at least it’s still there, still being used by the community. Yes, but……. his voice tails off and he launches into his real pre-occupation, the renaming of regiments. The Cheshire will be the Mershuns. Oh dear oh dear and they have been Cheshires since 1689, a very long time. Mershuns. Ohdearohdearohdear. There are some things which though regrettable are not worth my getting worked up about, and this is one of them, so I take the piece of paper and leave. Head off out of Frying-town heavy with the fatty stale smell of the Lamb Dinners and into the countryside, taking in Denbigh as the sun is beginning to set. A building in Denbigh which is made of brick, has stones which say 1882, emblazons its credentials as the Volunteers Drill Hall in carved stone, was shoe-horned by its founders into the very middle of its terraced brick community and is busily alive with men of conscription age playing snooker. Great blog – u got there before me then glad u got ur pictures!